On Nov. 30, 2018, Hot Springs Village Property Owners voted "NO" to all 12 proposed changes to the Hot Springs Village Declaration and a proposal to incorporate. Read John Cooper III&apos;s statement here. To contact us, visit our Hot Springs Village office at 110 LaPlaza West Ste. D. The office is open Monday - Wednesday from 10:30 a.m. - 3 p.m. We will close for the holidays on Dec. 17 and reopen Jan. 7. 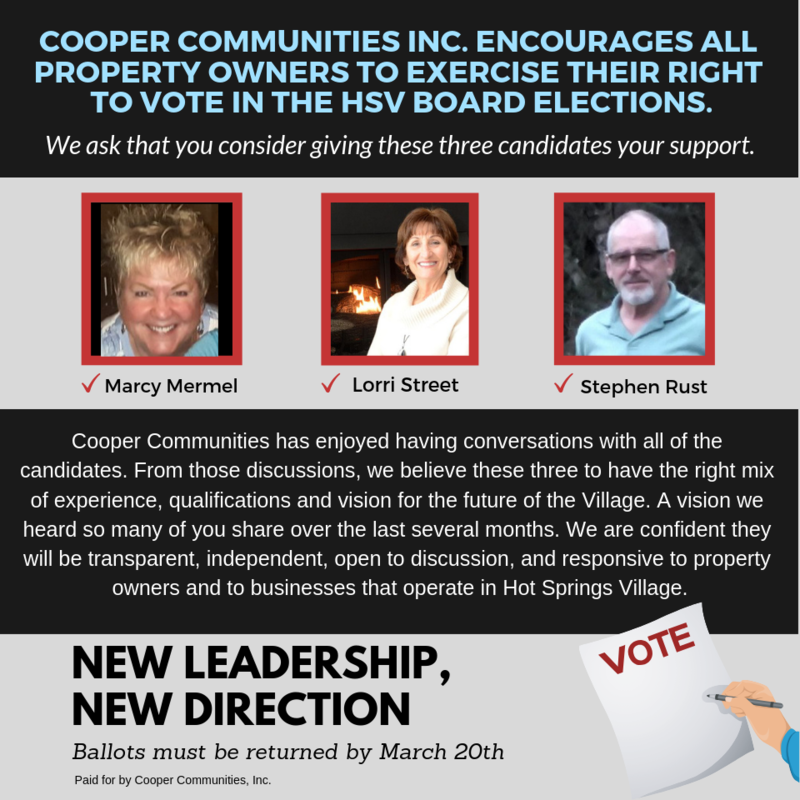 Looking for information regarding the HSV Board Elections? Click here to learn more about the candidates Cooper Communities is proud to endorse. The Cooper family is committed to the success of Hot Springs Village, and thoughtful development practices always guide our hand. For three generations, Cooper Communities, Inc. (CCI), one of the most established and well-respected community builders in the nation, has developed the Village with the best interests of its property owners in mind. While over the years POA board members and management have come and gone, CCI has remained a consistent presence in the Village, relying on our tested experience to develop when and where doing so has most benefited the Village. We are deeply concerned regarding the current vision being presented by the Board of Directors (Board) of the Hot Springs Village Property Owners Association (POA) in its newly commissioned Comprehensive Master Plan (CMP), a plan developed without input from, or the involvement of, CCI. CCI does not and cannot support this CMP, which is not in the best interest of the Village. Hot Springs Village is first and foremost a community. We feel that this CMP and the proposed amendments to the Declaration will cause long-term harm to HSV and to members of the POA. POA members should know that implementation of the CMP is simply not feasible based on current market conditions in Hot Springs. The Village was created to be welcoming to all; even a surface reading of the CMP reveals that the CMP pits residents against non-residents, raises costs for non-residents and creates restrictions, regulations and conditions that will make it difficult for outsiders to develop in the Village. These are some of the many reasons HSV was not originally designed as a municipality. The POA’s CEO has raised, in recent communications, the issue of CCI’s motivation. Please know that CCI has never been shy about our economic motives and that remains the case today. When CCI does well, we reinvest in amenities and new properties. CCI remains committed to working with members of the POA to ensure that HSV remains a desirable, livable community. CCI has invested $110 million into Hot Springs Village. Specifically, the CMP is bad for the Village because real estate development is a high-risk business and CCI believes the POA’s trying to become a developer is an unadvisable and unjustifiable assumption of financial risk. The simplest economic downturn can bankrupt even the most successful developers; imagine what such a downturn would do to the POA if it is allowed to get into the development business. POA management recently invited and initiated discussions with CCI regarding CCI’s selling its assets in the Village to the POA. Meetings were held and offers and counteroffers were made until it became clearly evident to CCI that POA management was not negotiating in good faith. Members must ask themselves whether or not POA management is qualified to assume the role of developer, a function far outside of its scope of responsibility. What are the qualifications of the current leadership? Even a quick review will reveal POA management and Board members do not possess any meaningful experience in residential land development and the composition of the Board will change in the future so that the Board may become even less qualified. The Board has already approved the adoption of the CMP. If the Declaration amendments are passed, power will be vested in the Board to proceed with implementing its ill-advised plan. Do you share the same vision as that articulated in the CMP? Do you fully understand the rationale behind, and the implications of, the POA’s attempt to make such significant changes to the Declaration and articles of incorporation? Do you have confidence in the POA’s untested leadership to complete such an expansive development? We respect the POA’s right to call an election, and we certainly respect property owners’ rights to vote their interests; we feel strongly, however, that Members should be given fair and correct information on which to base their votes. We hope you’ll find the information provided below beneficial. In the following weeks, we will continue to provide members with more information and we will be staffing an office at La Plaza dedicated to discussing this important vote with membership. We will have an open door policy and are willing to meet with any Member to discuss the future of Hot Springs Village and the harmful decisions and action taken by the Board and its CEO. Cooper Communities, Inc. is a community development group specializing in fiscally, environmentally, and responsibly built neighborhoods. With an outstanding, well-respected reputation of creating real neighborhoods generations of families can call “home,” CCI is the expert in community development and expansion.